We are always looking for ways to make your life easier by improving the usability of our software. Below are a couple of new options you can use when exporting your invoices to some of the leading accounting packages like Xero, Sage, Kashflow or Clearbooks. Marking invoices as exported - this is particularly useful if you don't want to export all your invoices to your accounting software. From the Invoices screen, any invoice that hasn't been previously exported will be highlighted with a red dot ( ) under the 'Exported' column on the right. To mark an invoice as exported, simply click on the 'more' icon ( ) then click Mark as exported. 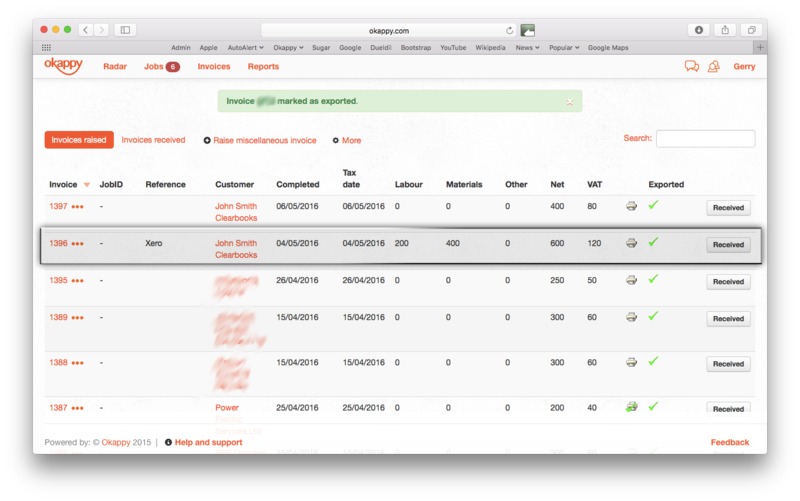 Once the invoice status is updated, a green tick ( ) will appear nuder the 'Exported' column. The invoice is now 'marked as exported' and won't be included the next time you export your invoices to your accounting software. You can also mark invoices as 'not exported' if you want to re-export your invoice to your accounting software. From the Invoices screen, click on the 'more' icon ( ) next to the invoice ID that you've previously exported then click Mark as not exported. Once the invoice status is updated, the green tick ( ) under the 'Exported' column will have now changed back to a red dot ( ) to indicate the invoice has not been exported. You can find out more about our invoicing features here.